Supplies of prime cattle seem to have slowed up a little again this week, as finishers are hoping for a price rise in the near future. 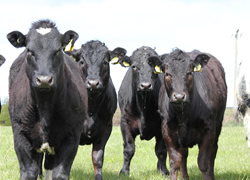 Prices are in the region of 375p for R4L Strs & Hfrs. For those of you who are interested, the price on the same day last year was 370p Kg. Cows are continuing to be wanted at slightly increased rates, with boning cows particularly sought after for export. 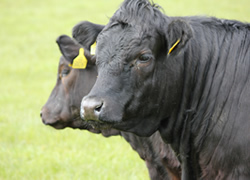 Aberdeen Angus cattle still command a premium with prices quoted of £ 4 per kilo and this trade is set to continue for a while yet. Store cattle are plentiful just now with 400+ kg cattle finding a ready market, the most encouraging thing for us this year is, that English finishers are keen to source suckler bred beef bulls. As the season for selling lamb moves into its final quarter, prices are still around 70p kg ahead of last year. With supplies tightening we are hoping for the trade to move on significantly in the next week or so. 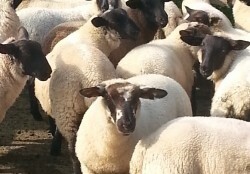 Prices for standard lambs this week are in the region of 415p kg with Blackface lambs commanding a small premium. It is encouraging to report a jump in the price of cull ewes by around £10 per head over the last week. With Organic prime cattle keenly sought after prices are holding firm and there is no problem moving them. However lean Organic dairy cows may be better placed for boning outlets, advice on this can be sought from David Marshall in the office (01750 723366). Organic lamb however, is a completely different story from last year as numbers are in short supply and most processors are keen to do deals to secure supplies, around 440p is the base price for next week. Speakers include Raymond Crerar and Iain Riddell, SAC Consulting; Bob Howat, Kinnaird; Jonny Williams, Farm Stock Scotland; Suzie England & Bill McKinnon, Scotbeef; All farmers welcome. Phone the office to secure your space.